Unstretched and unframed. Formerly stapled onto 92.97.117. 1 painting : image 31 x 38.875 in., unstretched canvas 33 x 41.125 in. Split image of Buddhist and Christian couples praying. Scene on left, a man in tan shirt holds hands in gassho (put hands together and bow head) while holding juzu (Buddhist prayer beads) next to a woman in brown. Both sit with their backs to the viewer facing a table with a blue runner, a bowl of fruit and black bowl of burning incense. Above it floats an image of a Bodhisattva, Yakushinyorai, swathed in robes in a golden oval in a field of blue. To the left, a tan strip of kanji, "Namu Amidabutsu." 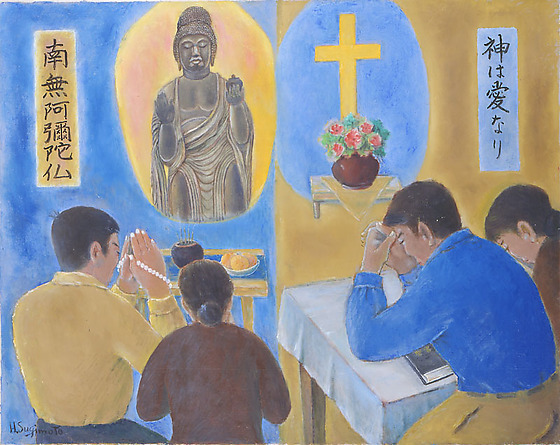 Scene on right, a man in blue shirt folds his hands in front of his face as he leans against a table covered by a white cloth, a Bible (Seisho) in front of him, next to a woman in brown. Both sit turned three quarters away from the viewer facing a table with a tan triangle cloth under a bowl of red flowers. Above it, a golden cross stands in a blue oval against a tan field. To the right, a blue strip of Japanese writing, "Kami wa Ai nari (God is love)."